Umbika Churn Rai (1827-1902) my great great grandfather, was the founder of the modern Roy family of Behala. He himself was the great grandson of Raja Daibaki Nandan Rai who is said to have brought the family to Behala from Anarpur at the time of the Mahratta invasions. Daibaki Nandan was probably gifted land at Behala as was customary towards Brahmins. The legend is that upon his arrival, a famed band of local dacoits/robbers gave him an ultimatum to surrender the family’s jewels or fight. Daibaki Nandan stood and fought, had his arm cut off by a scimitar, and died bleeding. The family then fell materially for two generations and were “toll pandits” or “tree-shade teachers” under Jagat Ram Rai and Durga Prasad Rai. Umbika Churn was Durga Prasad’s third son. He was a brilliant ambitious man, well-built and over 6 ft tall, who taught himself English, attended the madrassa started by Warren Hastings to learn Persian, and was well-versed in Sanskrit. Being knowledgeable of Sanskrit, Persian and English at a time of conflict of laws between English, Muslim and Hindu systems, he started as a translator in the Alipore Court under Sir Barnes Peacock (1810-1890). 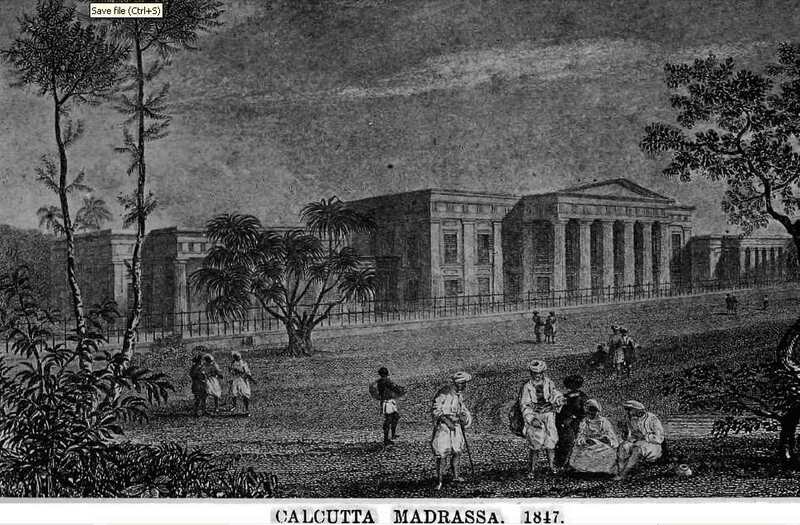 When Peacock went to the new Supreme Court in Calcutta in 1859 as its first Chief Justice, Umbika Churn went with him and rose to become the first Chief Translator. He was made a Rai Bahadur at the time of Queen Victoria’s Jubilee. Rai Bahadur Road in Calcutta is named after him. The Golden Book of India published at the time of the Victoria Jubilee said Umbika Churn was a descendant of one Raja Gajendra Narayan Rai, Rai-Raian, a finance official under the Great Mughal Jahangir. There will be much more about him here in due course. Most interesting is the fact that Chief Justice Peacock who had been his mentor, when he returned to England in 1870, later wrote asking him and his eldest son Surendranath for help on behalf of his son, a lawyer, being sent to Calcutta from England. Suren, himself a lawyer at the time, wrote back and assured him he would help find the son work in Calcutta! I shall upload that correspondence when I am able to. 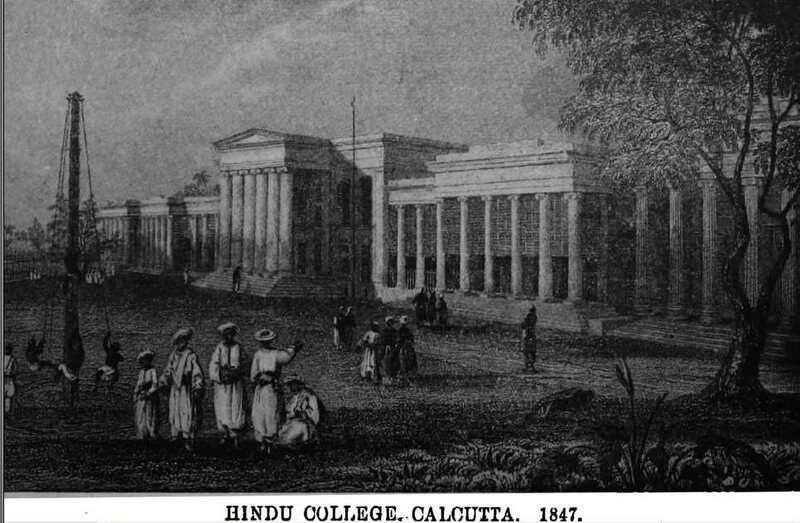 And along with Hastings’s Madrassa came Hindu College too, also depicted as of 1847, which became in due course Presidency… Associated to it was a Hindu School too, and our family legend went that Vidyasagar (1820-1891) himself, took his friend Umbik’s eldest son, SN Roy (1860-1929), my great grand father, by hand as a child to attend it. 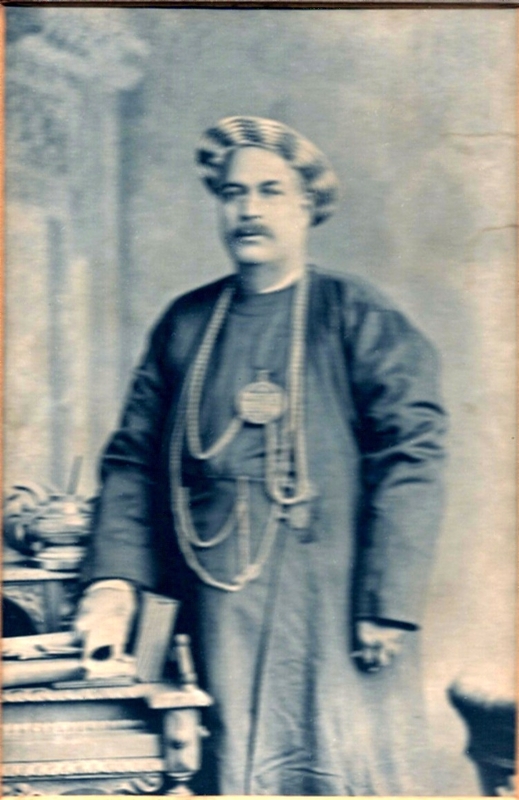 Surendranath was the eldest son of Rai Bahadur Umbik Churn Rai (1827-1902). The Golden Book of India published at the time of the Victoria Jubilee said Umbik was the twelfth descendant of one Raja Gajendra Narayan Rai, Rai-Raian, a finance official under the Great Mughal Jahangir. 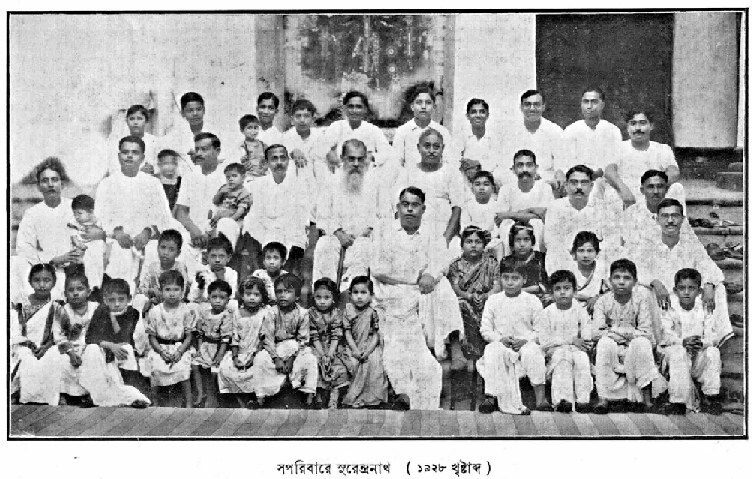 Surendranath’s second son, my grandfather, Manindranath Roy, is seated second from the right in the second row with spectacles and moustache. The bright lad fourth from the left in the last row would grow up to be my father.